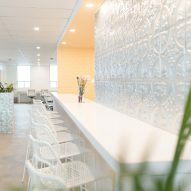 Phone booths with grassy carpets, a floral mural, and rose-pink and lemon-yellow furniture feature in this women-only co-working club in Toronto, designed by locally based MMNT Studio. 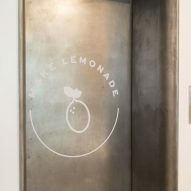 Launched in September 2017, Make Lemonade provides 3,000 square feet (278 square metres) of workspace just for women in the Canadian city's Downtown area. It was founded by Rachel Kelly, who had struggled with noise levels and limited seating while working in cafes across the city. Kelly enlisted MMNT Studio – also known as Moment Illustration – to create a peaceful yet "playful" environment suited to a range of working styles. To achieve this, the local design studio separated the open-plan space on the top floor of an office building into into three zones. White-painted walls and refinished concrete floors run throughout to provide a blank backdrop for the different finishes in each. "It is the result of an ambitious retrofit to an outdated closed-concept office into a playfully evocative workspace for independent professionals," said MMNT Studio. "Internally the project divides into three distinct styles of work areas which cater to the varied needs of its community." Members are encouraged to chat and collaborate in the area located on the southern side. Designed to "mimic the feeling of a sunny patio", it features a grass-like carpet, pale green outdoor chairs and tables and large plants. There are also a pair of lemon yellow chairs – one of a number of yellow touches that reference the club's name – and a wooden bench built beneath the large south-facing windows. The middle portion is set out like a large, open-plan living and dining room, and intended as an informal working area. 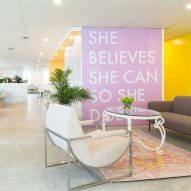 It includes four wooden desks with white, blue and pink chairs, and a sofa in the corner beneath a pink wall sign that reads "She believes she can so she does". The communal kitchen, which is fronted by a long bar with high-level seating, faces into the space and is a hub for Make Lemonade's events. A yellow-painted ceiling and matching tiling complement the white cabinets, and white wall tiles. 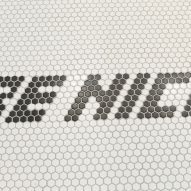 The hexagonal floor tiles are also predominantly white apart from the black floor tiles used to spell out "Be Nice" at the entrance to the kitchen. A low-level embossed silver wall provides a partition between the third space on the northern side, where the 24 rentable work stations are located. Subtle finishes and furniture like pale wooden desks and white chairs are modelled on a "traditional office setting". Glazed doors open onto two phone booths set at the rear. Both feature a grass-like carpeting, but one has a pink-painted back wall and the other is yellow. Grassy flooring in the club's meeting room is complemented by painting of leaves on the back wall. Make Lemonade offers a range of membership packages depending on requirements. The most extensive "Whole Lemon" bundle offers private workstations, while "Half Pressed" includes access to the shared desk space. 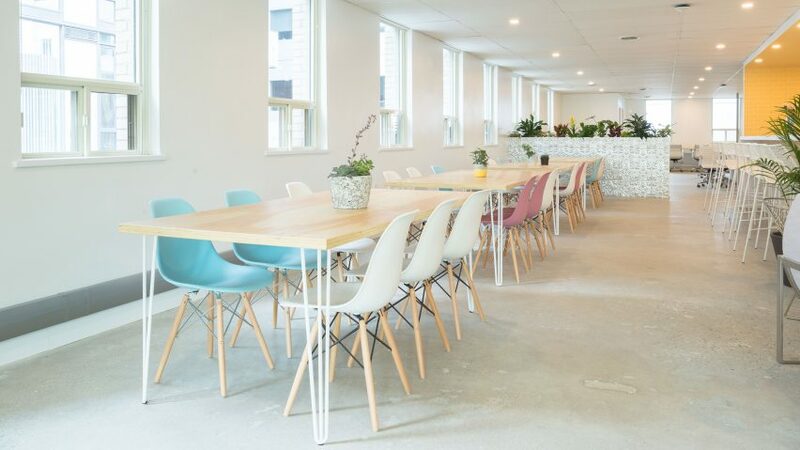 A once-a-month drop-in pass, and discounts for access to meeting rooms and events are included in the more limited "The Zest", while other members can buy meeting room or day passes. Everyone is welcome to enjoy free coffee, tea and lemonade. Male colleagues, friends and partners are allowed to access the club for meetings and events. By basing its membership on gender, Make Lemonade joins a number of similar women's clubs opening in cities around the world with the aim to provide a supportive community for working women. Others include The Wing, which has recently opened three locations in New York – including a Soho loft and an old paper factory in Dumbo. Photography is by Cameron Bartlett.